Our baby boy's nursery was inspired by the Land of Nod "Not A Peep" Bedding. As it's our first baby, we wanted to do more of a gender neutral color scheme with mostly gray, yellow & white with pops of aqua. We fell in love with the quality and patterns of this bedding set and designed the whole room around these colors and patterns. The elephant hamper from Home Decorator's Collection inspired the elephant and giraffe theme. The baby's room was formerly a guest bedroom that we knew would eventually be transformed into the nursery. Before we moved in, we had the room painted in a gender neutral gray Sherwin Williams Amazing Gray SW 7044 @ 50% shade. Our crib was Munire's Keyport lifetime crib, which we bought from Buy Buy Baby. What brand of nursery furniture did you choose? Where did you buy it? We bought our dark gray Little Castle serenity glider with white piping from Buy Buy Baby. The rest of the nursery furniture - the HEMNES 8-drawer dresser, HEMNES nightstand and KALLAX bookshelf were all bought from IKEA. To match the decor and give it more personality, we changed out the drawer knobs on the dresser from door knobs from the Etsy shop "Leila's Loft." What nursery bedding set did you use? Where did you buy it? We bought the "Not A Peep" crib skirt, sheets, blanket and changing pad cover all from the Land of Nod. We opted not to buy any of the bedding in a bag sets as we did not have a use for some of the items such as a crib bumper. Tell us about your window treatments, nursery lighting, rugs, wall decor and accessories. Where did you buy them - were any handmade? The rest of the nursery's accessories and decor was purchased from a variety of different sources/stores. Our favorite part of the room is the alphabet wooden letters above his crib. I purchased them unpainted from the Etsy shop "ACharmedNest." Then, my friend and I spray painted the letters in the colors of the nursery theme. For some of the letters, we modpodged various scrapbook papers that matched the different patterns found throughout the room. art work above his nightstand using IKEA frames and scrapook paper. I also painted stenciled numbers on the aqua bins found on his bookshelf. The aqua rug was bought from Land of Nod. The elephant-shaped diaper caddy & blackout chevron curtains were bought from Pottery barn. The lamp on his nightstand was bought from IKEA; the lampshade on his changing table was bought from Etsy shop "Zacharydicorydock" and is paired with a pottery barn lamp base. The yellow giraffe print pillow cover on the glider was purchased from Etsy shop "PillowsByJanet." The boon organizer on the wall above the changing table was purchased from Amazon and will be useful for housing extra pacifiers, nail clippers, brush, lotion, etc. The fabric flag above his changing table was from the Etsy shop "Thespottedbarn." The mirror above his changing table is from IKEA, and it is has stickers at the bottom of it that say "For this child, we have prayed - 1 Samuel 1:27." The baby's books will be stored on the top shelves of the bookshelf and his toys will be stored in the numbered bins on the lower shelves. His everyday stuff like onsies, burp cloths, diapers, blankets are stored in the dresser in fabric boxes bought from IKEA. The closet has bins for his bigger sized clothing that he will grow into, and it also has more bins and shelvings for extra diapers and things he will need in the future like feeding supplies. I started mentally planning and designing the nursery for ~2 months but putting it together took ~1 month when I was 5-6 months pregnant. Designing the nursery and our baby's future "home"/play room was one of my favorite parts of being pregnant and made us his look forward his arrival even more. Friends and family helped us assemble furniture and hang the decor. What do you love most about your little one's finished baby room? I love the bright colors and the calming effect it has. We also love that my husband and I designed the room ourselves by pulling inspiration from various places, and we hope our baby boy loves it as much as we do! 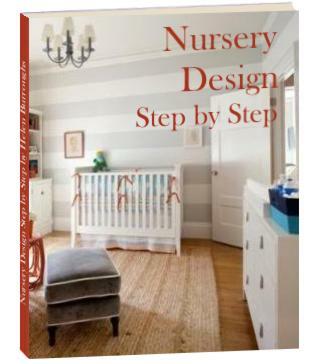 The first thing that attracted me to this nursery was the different patterns-chevron lines, straight lines, dots and even the pattern on the floor is unique! The splash of blue and yellow really bring the patterns and the room together for a trendy look. Teena defintely has an eye for great design! I love this nursery. I've been searching Pinterest for ideas for my own nursery and I want to replicate this room. It is cozy, neat, and has my favorite animal--elephants! I love the whole theme! Color selection is fantastic and the placement and selection of everything appears well thought out! Love the color scheme of this nursery, and the overall layout is modern and organized. I am impressed by the amount of time and effort the parents placed into this nursery, especially all the DIY touches with respect to the alphabet wall, fabric bins, and other decor. I am sure this little baby will enjoy this room and appreciate all the efforts his parents put into it! This is such a beautiful baby room! I love that it's not the typical blue room for a baby boy. Not only is it adorable with the great color scheme and decorations, but it is so functional with great organization and accessibility to what you need for the baby! I love the calming effect the colors of this room bring to its clean, modern design. The best of both worlds! Return to Baby Nursery Photos Contest 2014.